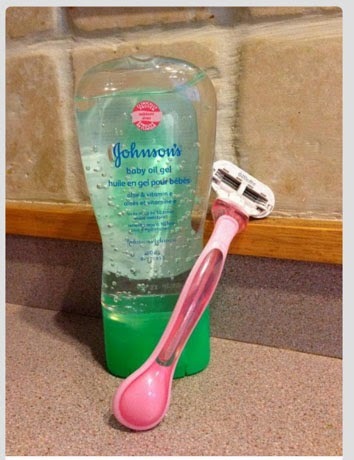 Myth - Does shaving with baby oil really help keep hair from growing back longer than shaving without it? By shaving with baby oil gel it not only pprovides a closer shave with no nicks and bumps but it is better for the razor blade making it last longer. Baby oil does not contain any alcohol, so its better for your skin and seals in moisture and it doesn't run off in the shower. This not only saves my shave but it saves time and money, win win win! I would say this myth is busted and it really works! Try it out and let me know if it worked for you! Two days? It takes you two days to get stubble? I must be part mammoth or something because I get goosebumps getting out of the shower and BOOM - stubble. But if it works even a little, I'm whipping out the baby oil! I'll have to give it a try! Thanks for the tip!